THE EMPRESS, by Lucy Chen, 8”x11.5”, oil on cradled birch panel. I believe I entered 2019 with a clear intention- to embody the energy of The Empress, a Major Arcana card of the Tarot. Thus, I made a point of making this my first painting of the year. If you were to write down three words to describe The Empress, what would they be? Leave your answer in the comment. For me, they are confidence, the innate ability to attract (vs striving) and receive abundance and pleasure, as well as the creative life force. It has taken me weeks to come up with the concept of this painting, and actually executing the concept took many days, too. I stalked Mecca Woods (the model in the painting) to find as many photos of her as I could, made many rough concept sketches and composition sketches in Photoshop and sketchbook. Some with her sitting like the traditional RWS Empress. Some with her standing and walking. Some are viewed from the side. Some from the front. 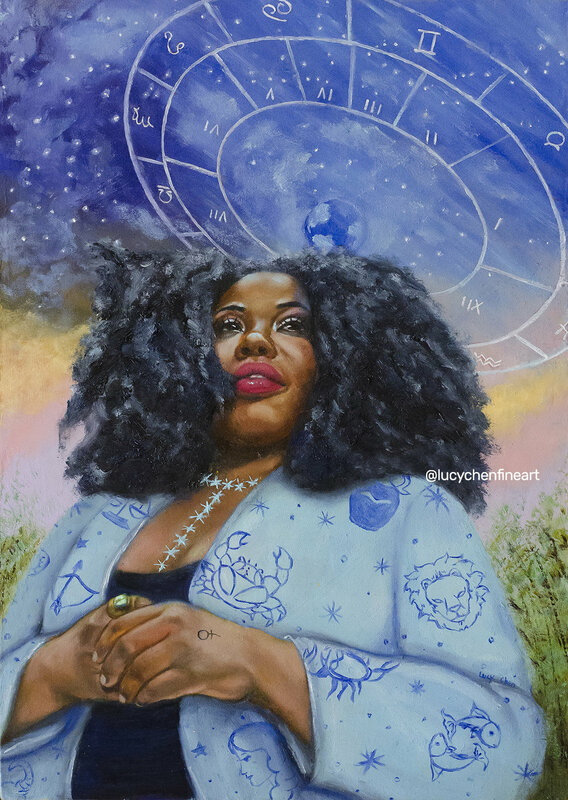 Finally, the idea of painting an astrology chart filled sky hit me, and I decided to use the photo she is currently using as her profile photo on her social platforms (photo taken by Schaun), where we look at her from a lower angle and she seems to be looking towards the sky. The execution of the concept had been a challenge itself. First because I never painted many black people or dark skin before. In fact, the only other black person I painted was The Fool. And you cannot simply copy the colors in the original photo because the colors in the backgrounds are very different and they affect the colors of the portrait. Second challenge was the color of her robe. I had painted it green, yellow, pink, purple, before finally decided on this light blue color. Third challenge was back to the concept itself which led to changes as the painting progress. I wanted to make her hold some wheat bundles initially and wear a star crown. But both seemed to clutter the picture. So I let go of the wheat bundle and gave her a 12 six-pointed star necklace instead of a crown. I think the challenges in the creative process is a reflection of my own blocks when it comes to embodying the Empress myself. You see, I have the tendency to diminish myself, the self-sabotage pattern of believing that I’m not worthy of receiving, compare myself to others and end up convinced that I’m simply not good enough. However, I believe by painting the Empress, I have shined light on my shadow, and worked through some of these blocks. It does require confidence, at least, to paint the Empress after all. Benebell Wen’s Tarot and Shadow Work for Activation Dynamic Power course, which I highly recommend if you want to bring more awareness into your self. It is through this course I started late last year that I decided to work with The Empress, and I’m daily Qi cultivation practice and monthly moon rituals to activate my inner Empress. The Empress episode of Taro Bytes, and Guidance on Every Card: The Empress blog post, both by Theresa Reed, aka The Tarot Lady. Discover Tarot Card meaning, The Empress, by Ethony. And simply Google all the beautiful artwork of The Empress card!